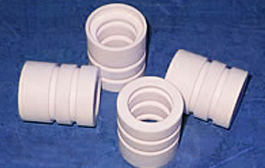 TETRON HG is the trade name for high percentage glass-filled polytetrafluoroethylene (PTFE). Glass fibre is the most commonly used filler, resulting in a lowered deformation under load at both high and low temperatures. Wear behaviour is also improved. Avoid use with Hydrofluoric Acid (HF) and strong alkalis. The glass fibre used is E-glass milled fibre, nominal diameter 13 microns to ensure even dispersion and optimum properties. TETRON HG mouldings have a homogeneous and dense structure. The surface is smooth with a white to light grey appearance.